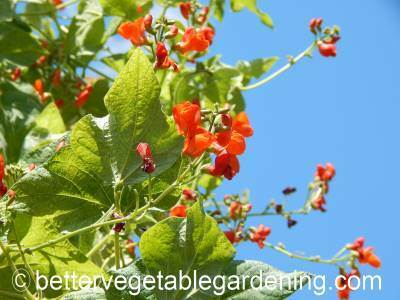 Runner beans are also known as scarlet runner bean, or multi-flora bean. In warm climates runner beans are a perennial plant, however they are grown in most garden situations as an annual. They are excellent when small and young as snap beans or later as the pods mature for dried shell beans. 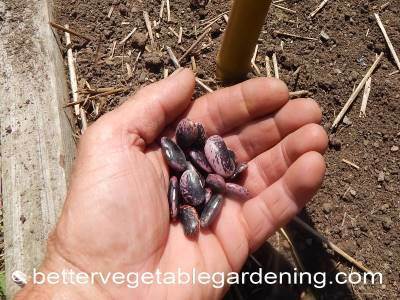 The beans are shiny black seeds mottled with purple. Runner beans are renowned for their red blossoms, the wonderful display of flowers, sometimes 20-30 on one flower stalk, attracts hummingbirds eager to taste the sweet nectar. They are grown in some gardens as an ornamental plant because of their very colorful flower display. 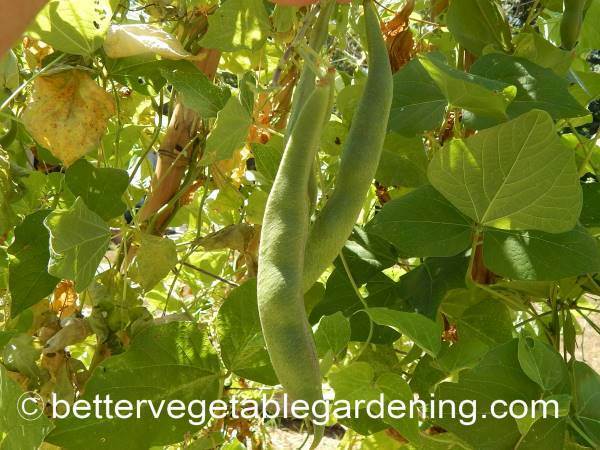 Runner beans are a warm season vegetable, they are frost tender and will be very grateful not to be planted until all danger of frost is past. Wait until mid spring when the soil is properly warmed, 60 F (16 C) or above and rising without any chance of a cold snap before planting runner beans. Beans will do best in well-drained soils mildly rich in organic matter with a pH above 6.0. is best. Too much nitrogen will result in more leaves than beans. Even though you will find runner bean seedlings at many garden centers unless you have an incredibly short growing season it is best to buy seeds and direct sow them to your garden. Trellis : sow seeds 2-3 inches (5-7 cm) apart and thin to best and strongest plants 4 inches (10 cm) apart when 3-4 inches (7-10 cm) tall . 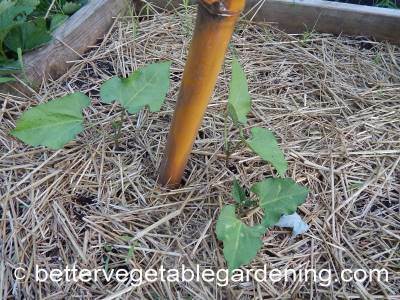 Teepee : sow seeds 5-6 per pole then thin to the strongest 2-3 per pole when 3-4 inches (7-10 cm) tall. Growing runner beans need consistent soil moisture, so give them a thorough soaking once a week in hot spells and apply a good thick mulch around the plants from the beginning. If you have access animal manure or compost enrich the area in later fall or early winter before you sow your seeds. While their fertilizer need are considered low compared to other vegetable that doesn't mean no fertilizer. 2-3 weeks before sowing, apply 2-3 quarts per 100 sq feet (2.2-3.3 liters per 9.3 square meters) of All-Purpose 5-5-5 Organic Fertilizer. Side dress with the same rate as the first flowers appear and every 3-4 weeks after that until the end of the growing season. Growing runner beans need a support to climb up and it is best to have your bean support in place when you sow your seed. 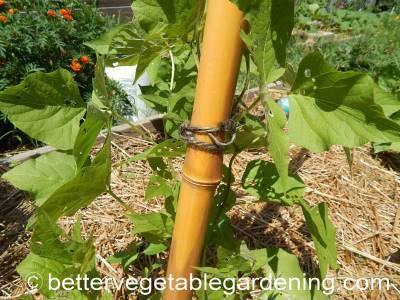 The traditional method is to grow them up bamboo canes like in this photo, but any trellis type support will be fine. This type of runner bean support the canes are usually tied near their top. 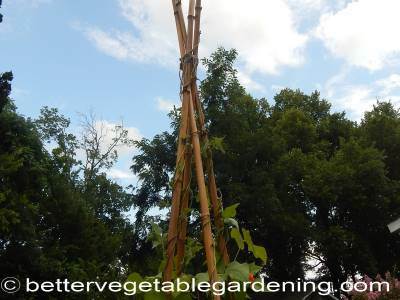 Loosely tie the plants to their supports when 12-18 inches (30 - 45 cm) tall, after that they will climb naturally. Finally, remove the growing tip when the plants reach the top of their support to encourage side shoots and limit the growing height as they are very vigorous growers and can easily out-grow a 12 - 15 foot (3.6 - 4.5 meter) high trellis. 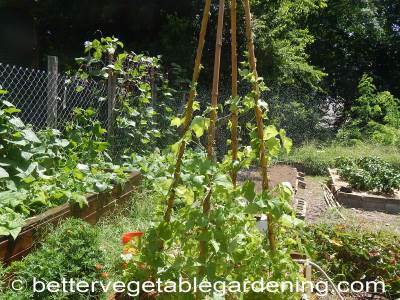 Crop rotation is as important with growing runner beans as it is with other vegetables. This is mainly to reduce the incidence of pests and diseases carried over in the soil from the previous year’s bean crop. Runner Bean depending on conditions and variety take 60 to 90 days to start producing. Start picking beans when they are young and tender for use as green snap beans. Pick beans before they get more than 8-10 inches (20-25 cm) long or they will be too old and tough. It is best to pick runner beans regularly. Even if there are too many for you to eat, give away, freeze or compost. It is vital that you pick regularly to prevent any pods reaching maturity. Once this happens plants will stop flowering and no more pods will be set causing a premature end of season. For short term storage green beans will keep in the fridge for a few days.